What was the world's most successful management company at this year's majors? Major menWas it IMG, home to players like Tiger Woods and Padraig Harrington? No. What about ISM, who look after the affairs of Lee Westwood and Ernie Els? Not them either. Take a bow Dublin based Horizon Sports Management, which poached Ross Fisher from IMG at the start of this year and Graeme McDowell from ISM two years ago. Of the 12 players to make the cut in all four majors this year, Fisher and McDowell finished first and tied second respectively. Fisher was T-30th in the Masters, 5th in the US Open, T-13th in the Open and T-19th in the US PGA last week. As for McDowell, he tied for second with Henrik Stenson (represented by Johan Elliot at Stockholm based Sportyard), the Ulsterman finished T-17 at Augusta, T-18 at Bethpage, T-34 at the Open and T-10 at Hazeltine. 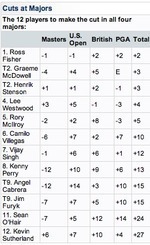 CBS Sports' Steve Elling compiled the 2009 Grand Slam leaderboard which shows Fisher pipping McDowell and Stenson by a shot with a cumulative +2 total. Lee Westwood was fourth and Rory McIlroy fifth. Amazingly, not one of that quintet them is currently a member of the PGA Tour and only four Americans made the list. Graeme McDowell sensationally announced last night that he's leaving Horizon Sports Management at the end of the year — on amicable terms — to manage his own affairs. The news, broken to Chandler by McIlroy in JFK airport on Wednesday night, came as a shock to the ISM founder. In truth, neither McIlroy’s exodus nor Horizon’s elevation to global player should come as a huge surprise to anyone. If you can’t beat ‘em. Graeme McDowell is congratuated by Rory McIlroy for his match play win at Finca Cortesin in May. Photo Eoin Clarke/Golffile 2011Graeme McDowell insists that he did not give Rory McIlroy the “hard sell” and actively recruit him for the Horizon Sports Management stable. Shanghai showdown after "jokes with jabs"
Rory McIlroy and Lee Westwood in action in Switzerland earlier this year. Credit: www.golffile.ieFormer stablemates Rory McIlroy and Lee Westwood are set for a tense Shanghai showdown today. But were what Graeme McDowell described as the “jokes with jabs” that they exchanged on Twitter simply the result of a clash of egos or a symptom of a deeper malaise? G-Mac on Rory exit - “I’m pretty sure Horizon weren’t giving him golf lessons"
Going their separate ways. 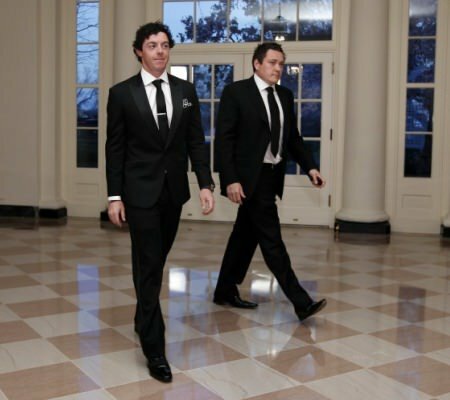 Rory McIlroy and Horizon Sports Management’s Conor Ridge visit the White House in March 2012. Little more than a year later, McIlroy has decided to do his own thing. (AP Photo/Charles Dharapak)Graeme McDowell exonerated Horizon Sports Management from all blame and suggested that Rory McIlroy’s decision to dump them and manage his own affairs has a lot to do with snapping out of the slump in form he reckons has been caused by the massive pressures on his young pal’s shoulders.